Keep your property safe with 24/7 professional monitoring and emergency response. Acadian Total Security systems are monitored by our own licensed central monitoring stations across the country, so you can count on help whenever you need it no matter where you are. Acadian Total Security offers cost-effective, home, fire, and burglary protection solutions to fit any lifestyle or budget. We offer a variety of systems including wireless and home automation options with affordable monthly fees. Our team uses advanced technology for fast, accurate, and professional response to any alarm signal. You will have peace of mind knowing your home is secured by Acadian Total Security. Access your lights, thermostat, security system and more from anywhere in the world while saving energy and money with smart programming and controls. High definition picture quality and low-light performance keep you in the know any time of day. Draw boundary lines and get notified when anything crosses 24 hours a day, seven days a week. From design to development and every step in between, Acadian Total Security utilizes the latest technology to give you the best in video and sound, inside and out. Around-the-clock monitoring and mobile alerts keep your family and property protected from fire and carbon monoxide, and our team of experts provide the support you need if an incident occurs. Keep your loved ones comfortable and protected with activity monitoring services and the medical alerts that set the standard and exceed your expectations. Acadian Total Security’s touchscreen panels seamlessly integrate home security system and automation features. Your panel can not only arm your system, but it can also control connected devices, including security features, motion sensors, smoke and carbon monoxide detectors, video security cameras, doorbells, locks, indoor and outdoor lights, garage doors, thermostats, and hundreds of home automation gadgets through one simple and convenient platform. Remotely manage your panel and devices from your smartphone or tablet, and remain in control no matter where you are. Plus, the app is now compatible with Apple Watch, Apple TV, Amazon Fire TV, Amazon Echo, and other Alexa-enabled devices. Save time, worry less and feel comfortable knowing your home and loved ones are protected by the best in the industry. Your system keeps working even if the security panel is damaged. Using real-time data, your panel will alert you to potentially dangerous weather conditions. Security that works for you. Acadian Total Security utilizes a tamper-resistant cellular connection, dedicated solely to your security system. This signaling technology works even if your phone line, cable, broadband and power are down. 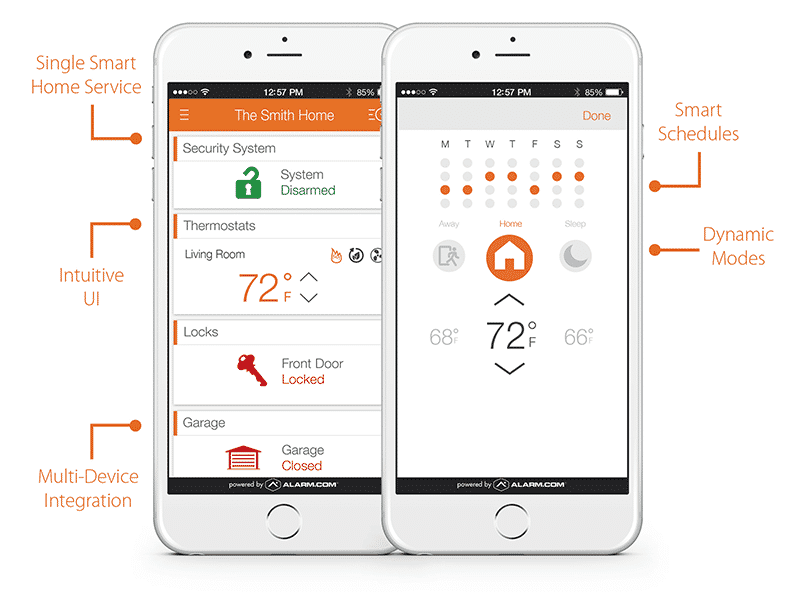 Our technology learns your home’s unique activity patterns and quickly alerts you of unusual events like doors being opened at odd times or lights being turned on when your family is typically asleep.